Sir Charles Algernon Parsons, OM, KCB, FRS (13 June 1854 – 11 February 1931), the son of a member of the Irish peerage, was an Anglo-Irish engineer, best known for his invention of the compound steam turbine, and as the namesake of C. A. Parsons and Company. He worked as an engineer on dynamo and turbine design, and power generation, with great influence on the naval and electrical engineering fields. He also developed optical equipment, for searchlights and telescopes. With his three brothers, Parsons was educated at home in Ireland by private tutors (including John Purser), all of whom were well versed in the sciences and also acted as practical assistants to the Earl in his astronomical work. One of them later became, as Sir Robert Ball, Astronomer Royal for Ireland. Parsons then read mathematics at Trinity College, Dublin and St. John's College, Cambridge, graduating from the latter in 1877 with a first-class honours degree. He joined the Newcastle-based engineering firm of W.G. Armstrong as an apprentice, an unusual step for the son of an earl; then moved to Kitsons in Leeds where he worked on rocket-powered torpedoes; and then in 1884 moved to Clarke, Chapman and Co., ship engine manufacturers near Newcastle, where he was head of their electrical equipment development. He developed a turbine engine there in 1884 and immediately utilized the new engine to drive an electrical generator, which he also designed. Parsons' steam turbine made cheap and plentiful electricity possible and revolutionised marine transport and naval warfare. Parsons' first 1 MW turbogenerator built for the city of Elberfeld, Germany in 1899. It produced single phase electricity at 4 kV. Turbinia, the first steam turbine-powered steamship and the fastest ship in the world at that time. Parsons was also interested in marine applications and founded the Parsons Marine Steam Turbine Company in Newcastle. 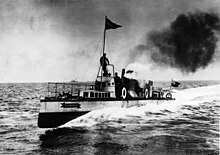 Famously, in June 1897, his turbine-powered yacht, Turbinia, was exhibited moving at speed at Queen Victoria's Diamond Jubilee Fleet Review off Portsmouth, to demonstrate the great potential of the new technology. The Turbinia moved at 34 kn (63 km/h; 39 mph). The fastest Royal Navy ships using other technologies reached 27 kn (50 km/h; 31 mph). Part of the speed improvement was attributable to the slender hull of the Turbinia. Dreadnought. 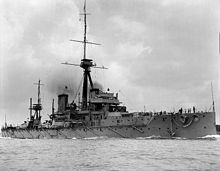 Considered the first modern battleship, in 1906 it was fastest in the world due to Parsons' steam turbines. He was elected a Fellow of the Royal Society in June 1898 and received their Rumford Medal in 1902, their Copley Medal in 1928 and delivered their Bakerian Lecture in 1918. He was the president of the British Association for 1916–1919. He was an Invited Speaker of the ICM in 1924 at Toronto. He was knighted in 1911 and made a member of the Order of Merit in 1927. Charles Algernon Parsons died on 11 February 1931, on board the steamship Duchess of Richmond while on a cruise with his wife. The cause of death was given as neuritis. A memorial service was held at Westminster Abbey on 3 March 1931. Parsons was buried in the parish church of St Bartholomew's in Kirkwhelpington in Northumberland. In 1919 Katharine and her daughter co-founded the Women's Engineering Society, which is still in existence today. Sir Charles Parsons is depicted on the reverse of an Irish silver 15 Euros silver Proof coin that was struck in 2017. Charles Parsons' grand-nephew, Michael Parsons in his 1968 Trinity Monday Discourse. ^ a b The Earl of Rosse (Autumn 1968). "William Parsons, third Earl of Rosse" (PDF). Hermathena (107): 5–13. JSTOR 23040086. Retrieved 6 September 2018. ^ "Sir Charles Algernon Parsons". Encyclopedia Britannica. n.d. Retrieved 6 September 2018. ^ Invernizzi, Costante Mario (2013). Closed Power Cycles: Thermodynamic Fundamentals and Applications. Springer. pp. 1–. ISBN 978-1-4471-5140-1. ^ "Charles Parsons (1854 – 1931)". Profiles of Scientists from Irish Universities. Archived from the original on 10 January 2008. Retrieved 6 February 2005. ^ a b Smil, Vaclav (2005). Creating the Twentieth Century: Technical Innovations of 1867-1914 and Their Lasting Impact. Oxford University Press. p. 62. ISBN 0-19-516874-7. ^ a b "Chronology of Charles Parsons". Birr Castle Scientific and Heritage Foundation. Archived from the original on 25 December 2008. Retrieved 3 January 2009. ^ Parsons, Robert Hodson (1939). "Ch. X". The Early Days of the Power Station Industry. Cambridge: University Press. p. 171. ^ Robertson, Paul (n.d.). "Charles Algernon Parsons". Cambridge University : 125 Years of Engineering Excellence. Retrieved 6 September 2018. ^ "Lists of Royal Society Fellows 1660-2007". London: The Royal Society. Archived from the original on 24 March 2010. Retrieved 15 July 2010. ^ Parsons, Charles A. (1919). "President's Address". Report of the British Association for the Advancement of Science. London: John Murray. ^ Parsons, C. A. "The steam turbine" (PDF). In: Proceedings of the International Congress of Mathematicians in Toronto, August 11–16. 1924. vol. 2. pp. 465–472. ^ "Sir Charles Parsons and Sir Arthurt Dorman". Obituaries. The Times (45746). London. 13 February 1931. col B, p. 14. ^ "Obituary The Hon. Lady Parsons". Heaton Works Journal. Women's Engineering Society. December 1933. Retrieved 6 January 2015. Scaife, W.G.S (1999). From Galaxies to Turbines: Science, Technology and the Parsons Family. CRC Press. ISBN 978-1-4200-4692-2. Wikimedia Commons has media related to Charles Algernon Parsons.